The leader of Germany’s Social Democrats came under growing pressure on Thursday (23 November) to drop his opposition to a new “grand coalition” with Angela Merkel’s conservatives, with senior politicians arguing the party had a duty to promote stability. Merkel is facing the biggest political crisis of her career since efforts to forge a three-way coalition with the pro-business Free Democrats (FDP) and Greens collapsed last weekend. That has raised worries across Europe of a prolonged leadership vacuum in the continent’s economic powerhouse. The Social Democrats (SPD) have governed in coalition under Merkel since 2013. But leader Martin Schulz said the party must heed the will of voters by going into opposition after achieving its worst result of the postwar period in the 24 September election. Pressure is growing on the party to revisit his decision, either by agreeing to prop up a conservative-led minority government by not voting against it, or by forming a renewed coalition. In either case, the position of Schulz as party leader could become untenable. If changing course and teaming up with the conservatives requires a change of leadership at the SPD, that would be unlikely before a party conference on 7-9 December. 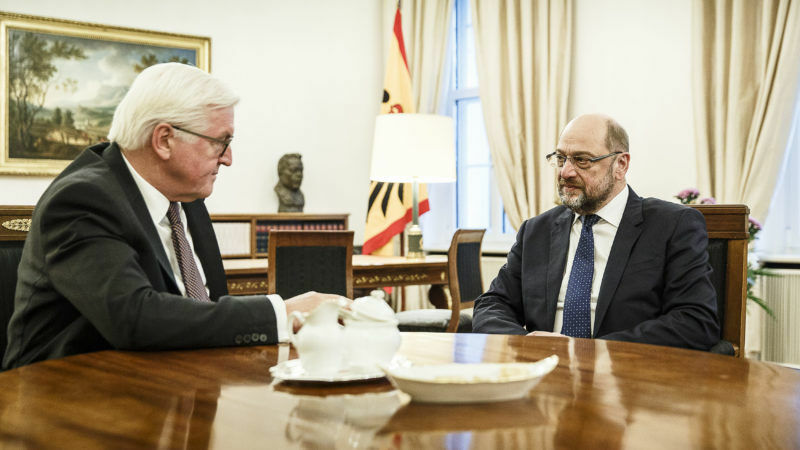 Schulz held a lengthy meeting with President Frank-Walter Steinmeier, a former SPD lawmaker and foreign minister, on Thursday afternoon before heading to party headquarters to consult senior party members. Steinmeier is trying to help facilitate a coalition government and avoid fresh elections. “We will talk about if and how one can get a federal government in Germany,” a senior SPD member said ahead of the meeting, adding that one option on the table was to support Merkel only indirectly by not blocking a minority government. But Stephan Weil, the SPD premier of the state of Lower Saxony, one of the party’s most influential figures after he defied polls by winning re-election this year, implied a full coalition would preferable to a minority government. “Minority governments are fragile constructs,” he told the RND newspaper consortium. The SPD had to chart a path between a party rank-and-file reluctant to repeat the bruising experience of a grand coalition and its democratic obligations. “Everyone understands that the stakes are high, involving the stability of an extremely important member of the European Union,” he added. 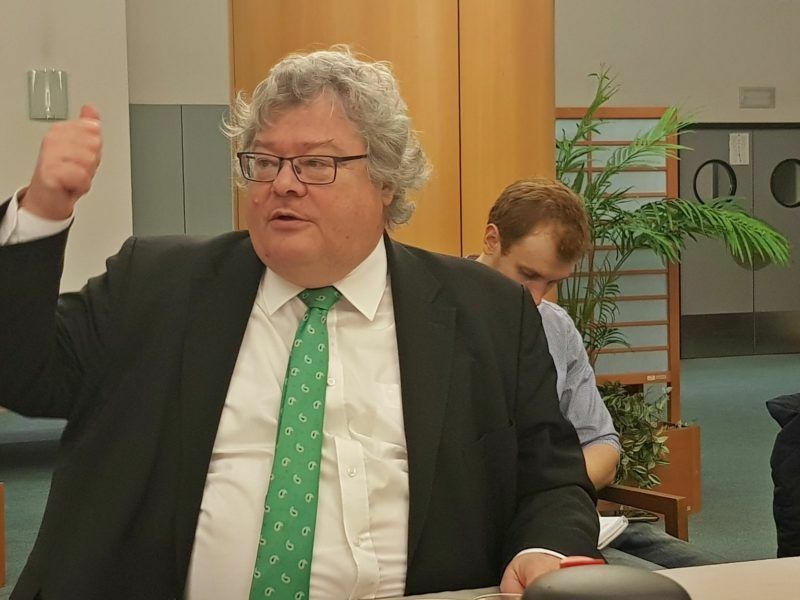 Volker Kauder, leader of the conservative parliamentary group and a key ally Merkel ally, echoed the sentiment, calling for the grand coalition to be reprised. “Europe is waiting for a Germany capable of acting so that it can finally respond to the questions raised by French President (Emmanuel) Macron,” he said, referring to Macron’s call for fiscal reforms to strengthen the euro zone. Germany, the world’s fourth largest economy, has long been a bastion of stability in the EU, and officials in Brussels and Paris fear months of political uncertainty could harm plans to reform euro zone governance and EU defence and asylum policies. Merkel, who remains acting chancellor until a new government is agreed, has said she would prefer to work with the SPD, but if that option fails, she would favour new elections over an unstable minority government. Another election would also provide no speedy resolution. Under Germany’s constitution, the president could call another election only after Merkel had lost several votes in the Bundestag – a process that could take several months. The mass-circulation Bild newspaper reported on Wednesday that 30 members of the SPD’s 153-strong parliamentary group this week had questioned Schulz’s preference for going into opposition during a meeting of the parliamentary party. Speaking to ZDF television on Thursday, SPD deputy leader Karl Lauterbach said his party might have to rethink its opposition to another “grand coalition”, but added he was still sceptical about joining one led by Merkel. The SPD supports Macron’s proposal to give the euro zone the power to spend money to protect members of the single currency bloc against external shocks. If the SPD changes tack about a “grand coalition”, however, the leader of Merkel’s sister party in the state of Bavaria, the Christian Social Union (CSU), said on Thursday it should not expect the conservatives to grant any significant concessions. “We can’t be blackmailed,” said Horst Seehofer, who is himself fighting to hang on as CSU leader in the face of internal opposition.